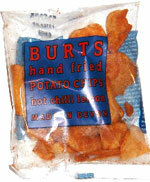 Taste test: These are kettle-style chips with a chili powder flavoring. It's a stretch to say they're really hot, but they are slightly hot if you eat a whole bunch of them. They're fairly thick, quite crunchy and taste really good. Smell test: You can definitely smell the chili powder. Nice.